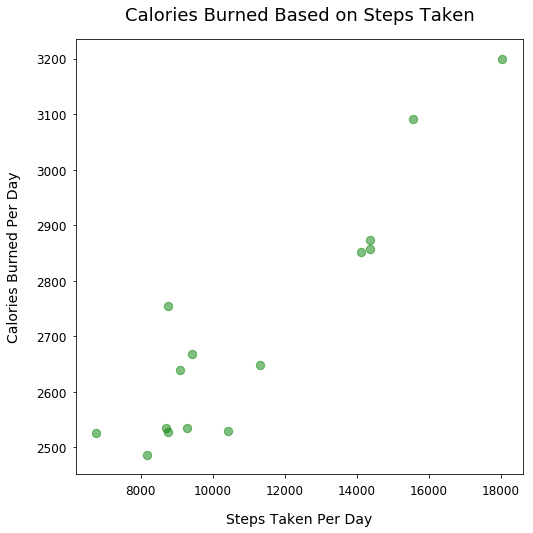 Below is my Fitbit data of daily step count and daily calories burned over a 15-day period. Utilize the c argument for the scatter method and set it to green to make the scatter points green. You can see additional colors on this Matplotlib documentation page. Utilize the s argument in our scatter method and pass in the value 75 to make larger scatter points that are easier to see. Utilize the alpha argument in our scatter method and pass in a numeric value between 0 and 1. A value of 0 will make the plots fully transparent and unable to view on a white background. A value of 1 is the default with non-transparent points. We'll make the scatter points slightly transparent so you more easily see the overlap of points near the bottom left of our plot.